Mesopotamia Religion - HISTORY'S HISTORIESYou are history. We are the future. Imagine it's a dark, cloudy night. It is raining. You can’t see the moon or the stars. 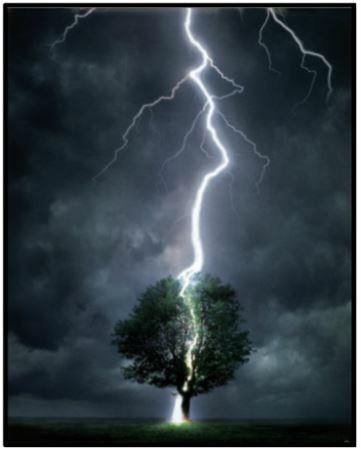 Then, suddenly, a lightning bolt explodes the tree a little ways down the street. How do you feel? Now, imagine you don’t have the benefit of science that can explain the lightning bolt. What would you think might have caused the lightning? If you lived in ancient Mesopotamia you would probably think that some force greater than man had done it. You might call this force a god. The Mesopotamians had gods for everything. If you got sick, one of the gods was mad at you. If your door stuck and was hard to open, maybe you weren’t paying enough attention to the gods. If two fields were side by side and one was growing tall with thick crops and the other was full of weeds, then it was obvious that the gods favored the one and disliked the other. You couldn’t see the gods, at least normal people couldn’t. But the ancient Mesopotamian people believed that the gods ruled every aspect of their lives. The gods, however, could be unpredictable. You never knew what the gods might do. Thus, it was the responsibility of every individual to do everything they could at all times to keep the gods happy. Kings were not gods. Kings were mortals, just like in the common man. In this, at least, all men were equal in ancient Mesopotamia. All men,including the king, were supposed to spend their time appeasing, or satisfying the gods. What role did the council of elders serve in Mesopotamia? Above are examples of Mesopotamian votive, or prayer, statues. In ancient Mesopotamia, everyone did their part to please the gods. The Assembly: The Assembly was a council comprised of some of the community's distinguished elder citizens. Since the King was just as eager and just as responsible for keeping the gods happy as were the common people, it made sense to these early people to elect a council - an assembly of wise men - people you could check in with to make sure that what you were planning to do would not anger the gods. The king sought approval for his actions from this assembly, just like everyone else. The assembly might say to a king, “No king, you can’t do that. That would anger the gods.” And the king would not do that. Everybody had to work together to keep the gods happy. That’s how things were in ancient Mesopotamia. And government by assembly can mean a form of democracy. Thus, because of their religion, the ancient Mesopotamians practiced an early form of democracy. Even the gods had to seek the approval of the assembly. Although it would be a neat trick, the gods didn’t actually appear in front of the assembly, but the assembly did discuss how the gods should behave and arrange themselves in the heavens - who could marry whom and who had what job, that type of thing - and that’s how it was. BRAINBOX: Why did the good gods want to get rid of Tiamat? Above, a cylinder seal showing the water god, Ea. CLICK to learn more about Mesopotamian gods and goddesses. As the celestial god ruling over the heavens, Marduk armed himself with lightning bolts. The Problem: Once upon a time, a long time ago, the gods in the heavens wanted to rid themselves of the evil goddess Tiamat, the goddess of chaos. Although every good god agreed that this was a great plan, no one wished to battle the evil goddess Tiamat, as she was very powerful. The Good Guys: In desperation, Ea, the wise water god, decided that Marduk had the best chance of defeating the evil goddess. True, Marduk was young, but he had many powerful skills and was extremely quick witted. Ea asked Marduk if he would be willing to challenge the evil goddess Tiamat on behalf of all the good gods. ​Marduk’s Terms: Marduk knew, if he took the job, he would have quite a fight on his hands. Marduk thought it over. He told Ea he would try to conquer the evil goddess Tiamat if the good gods agreed to his terms. The good gods had to promise to reward Marduk with the permanent position of “Chief of the Gods” if he battled the evil goddess Tiamat and won. Ea’s Tricky Plan: Ea knew he could not make such a deal on his own. Something of such importance would need the approval of the entire Assembly of the Gods. Ea was pretty sure that a lot of the gods would not be happy about this, especially the older ones who typically teamed up so their collective vote quite often ruled the day. Ea decided to throw a banquet and invite the entire Assembly to the party. He really went all out to lull the gods into a peaceful and happy state. Ea had his servants serve mounds of pancakes, a most favorite and sought after food in ancient Mesopotamia. He ordered that many huge vases, brimming with delicious date wine, be placed on the floor around the banquet table. Each god was given a tube (somewhat like a very long straw) to use to drink from the vases of wine. He had musicians play soft music on their pipes, accompanied by the bleating of live sheep, which was thought to be a most restful sound. Seal depicting a banquet. Note the bendy straw, another Mesopotamian invention, in the top row. The combination of pancakes and date wine, and the bleating of sheep put all the good gods in such a great mood that the entire Assembly agreed to Marduk’s terms. Besides, the gods really did not think the boy had a chance. The Battle: Marduk armed himself with a bow and several arrows, a thunderous club, a net of storms, and a saw-toothed lightning dagger. He went in search of Tiamat. Rolling his thunder and storms before him, Marduk fought one monster after another that the evil goddess Tiamat kept creating and throwing in his way. Each time he killed a monster, he moved closer to the evil goddess Tiamat. One day, he got close enough to catch her in his nets! When he did, Tiamat howled with fury. Before she could conjure yet another monster, Marduk shot an arrow down her howling throat, and killed her! What were Marduk's main weapons? The mighty Marduk took his club and split Tiamat’s body in half. He placed half of her body in the sky and made the heavens. He posted guards to make sure she did not escape and gave them twinkling lights to show that all was well. He created the moon to guard the heavens, and set it moving back and forth on an endless patrol. With the other half of Tiamat’s body he made the land. From both her eyes, he set the Tigris and the Euphrates rivers flowing. He planted fields of grain and vegetables, and blessed the land with rain, cows, forests, and orchards. Marduk told the gods who had supported Tiamat that they had to work the fields and tend the canals as punishment. These gods soon complained of all the work they had to do. They burnt their spades and baskets in protest. Marduk, with an eye on the future, promised that if they agreed to recognize Marduk for all time as the Chief of all the gods, he would release them and find others to do the work in their place. That’s how humans were first put upon the earth. Marduk created humans to do the work, to till and hoe, to tend the canals and animals, and to worship all the gods at festivals. Marduk is the patron god of which Mesopotamian city? Here, the sun god, Shamash, is shown holding the ring and the rod. ​Chief of the Assembly of Gods: Impressed, and as promised, the gods awarded Marduk with the permanent position of first Chief, leader of the Assembly of all the Gods. To this day, Marduk’s symbols are the saw-toothed lightning dagger that he holds in his belt, his trusty weapon that still helps him keep order in the heavens, and the ring and the rod. Brainbox Question: What are the Ring and the Rod and what do they symbolize?